Hello all! Welcome to September—it’s that time of year again when the magic of hunting season begins! The amazing wildlife, lifelong relationships, and sharing God’s great outdoors with others overcomes most of our minds! This year Kicking Bear will continue the tradition of bringing kids into the great outdoors for the annual Wisconsin Youth Deer Hunt! For more information and to sign up, please visit our website page HERE. This September, we feature a story written by 20-year-old Kassidy Farris. She participated in a Kicking Bear Camp in Indiana when she was 13 years old—little did she know that it would change her life forever. Kassidy was given the opportunity to spend two days at camp and learn the basics of a new sport that she would soon call her passion. 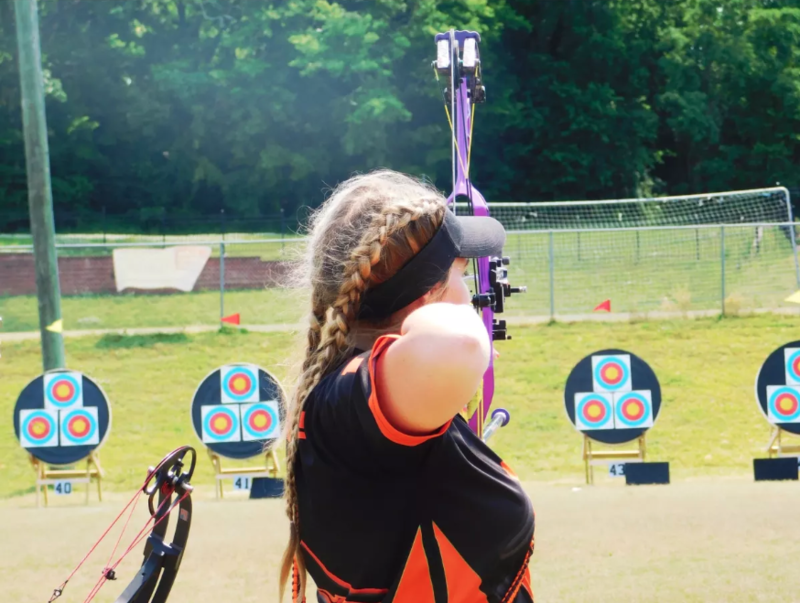 As she grew with the sport of archery, she found that God granted her the natural ability to shoot a bow while he guided her arrows through state tournaments during her high school career. Without Kassidy’s friends asking her to go to a Kicking Bear Camp, and without Jodi Hicks as a mentor and friend, Kassidy would not have experienced the amazing journey and opportunities that Kicking Bear and archery have brought to her. My journey in archery started in 2012, just a few weeks after I turned 13. Before that, I had never picked up a bow or known anything about the sport. An hour before I had ever heard of Kicking Bear, a few of my friends called me and asked if I would like to go out to Shakamak State Park for a camp. After giving me a brief explanation of what Kicking Bear was, I showed up not really knowing why I was there, only that it was outdoors and I was supposed to wear tennis shoes. I didn’t know the next 48 hours would change my life forever. After participating in many activities like field games, tomahawk throwing, and marshmallow fights, we learned how to shoot bows. With help from the volunteers and mentors at the camp, I was taught the basics of how to shoot a bow. A large group and I went out to the 3D range to shoot. After shooting at the first half of the targets, I realized that I was a natural at archery and that I really enjoyed it. The next day when I got home, I told my dad that I loved the camp and shooting archery. I also told him I would like to have my own bow and start shooting more. He was very excited about my new love for archery, but he questioned if it was serious. After convincing him to take me shopping, we went to Gander Mountain and purchased my first bow. After shooting it for about a year, I grew out of it and got my first target bow. With the help of Jodi Hicks, I went on to shoot in my first competition (IFAA State) and ended up winning four straight years. Jodi has been a mentor at Kicking Bear Camps in Indiana because she loves being able to teach young kids about a sport that she is passionate about. She also enjoys watching how Kicking Bear changes young kids’ lives as they grow up. Jodi is 21 years old and going into her senior year at Union College in Barbourville, KY. Besides winning IFAA state, I also won several ASA state tournaments and traveled all around the country to compete in Las Vegas, Nevada, and Redding, California. In high school I competed mostly with a target bow and occasionally with a hunting bow. During my sophomore year of high school, I placed in state and won a scholarship to Union College in Barbourville, Kentucky where I now attend college. Kicking Bear created a path in my life and I am forever grateful for the opportunities it has brought to me in the last six years. For the rest of my life, I’ll continue to cherish the experiences and the people that I have been able to meet. Without archery or attending the Kicking Bear Camp with my friends, I wouldn’t know all the amazing people I know now, and I would have missed out on this amazing journey. 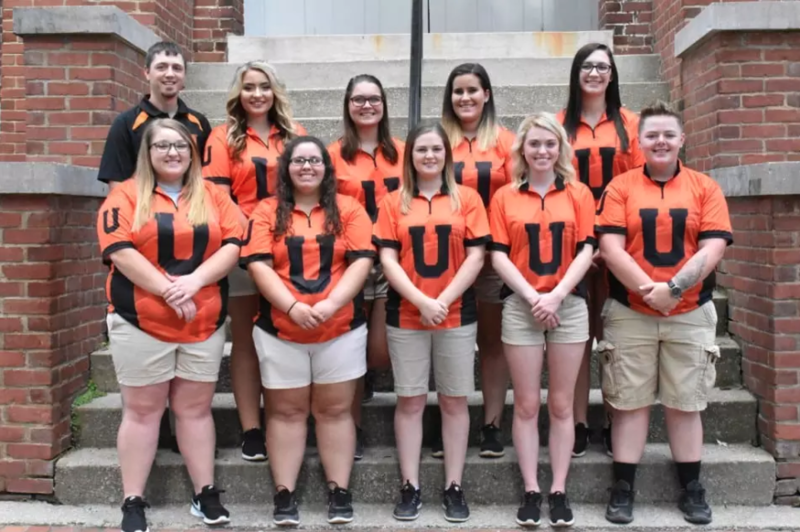 Kassidy continues to shoot archery at Union College in Barbourville, KY. It is her second year on the archery team, and she continues to embrace every opportunity that she is given with the sport. Kicking Bear is now going into its 20th year–there are several new camps starting up in 2019 across the nation, and only God knows the heights to which He will take them. Kicking Bear Ministry has been taking youth off the streets and changing their lives. God has allowed us to keep His camps and outings completely free-of-charge to all participants due to the great partners He has brought to the ministry. Of the 122 events and 76,000 people throughout the nation who were touched by Kicking Bear last year, below is yet another life-changing story. We are able to continue to host free events to the public and change the lives of the ones who need us most because of the continued financial support of people like you. Please consider either a one-time, tax deductible, year-end gift or a monthly recurring donation by clicking the “Support Us” button. Sign up for our Bear Path Newsletter! Read life-changing stories and testimonials of how God has worked in the lives of others! Receive emails about life-changing stories and testimonials of how God has worked in the lives of others. God’s Plan Mentorship: How can YOU have an impact? Kicking Bear Foundation © 2019. All Rights Reserved.